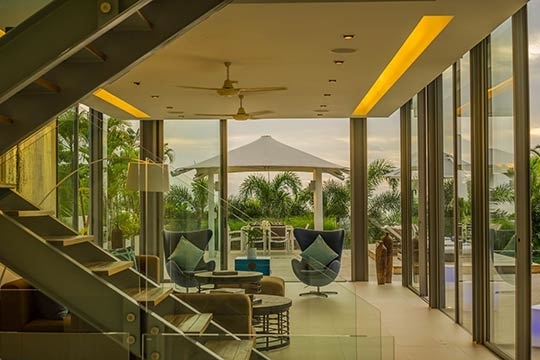 Villa Roxo is a four-bedroom holiday home set over three levels just off the sands of Natai Beach in the exclusive Sava Villa estate. 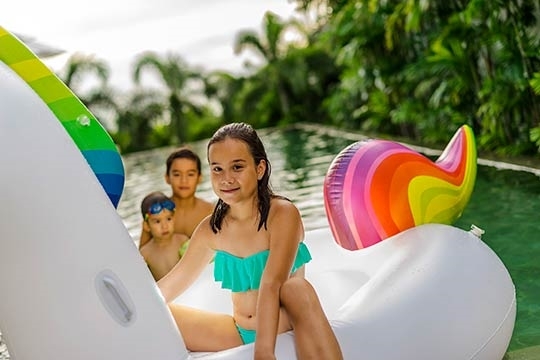 With modern and carefully designed indoor and outdoor entertaining areas offering sunset views, the villa is perfect for groups or families seeking to enjoy a fun-filled tropical escape. 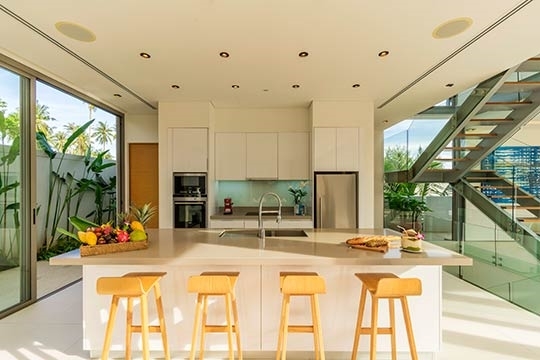 The middle level provides ample space for relaxing or entertaining, with a large open area housing the sea-breezy living room, dining room and a modern kitchen. 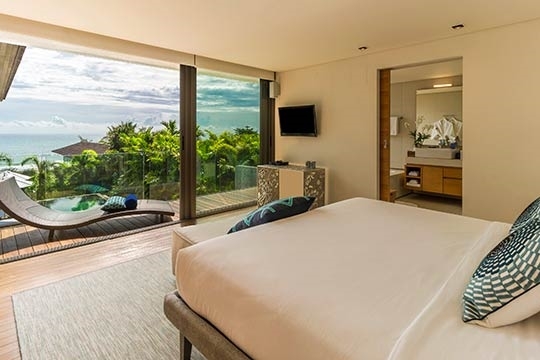 It’s almost entirely enveloped by floor-to-ceiling glass doors that slide open to the deep blue 18m infinity pool. 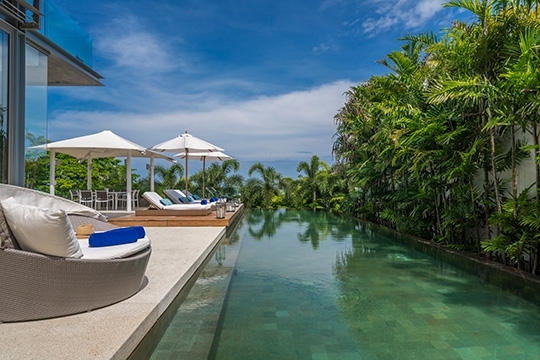 The pool terrace is furnished with sunbeds, a barbecue station and outdoor dining table. Guests also have complimentary access to the estate’s gym, which is next to the villa. 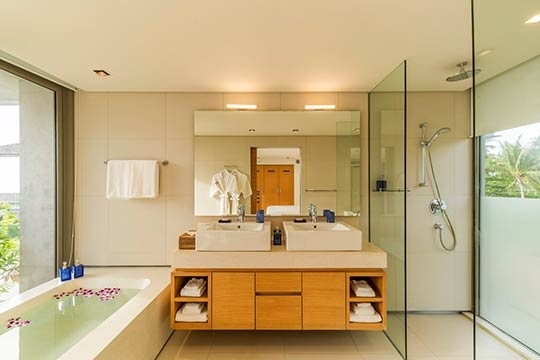 The best sea views are from the two master bedrooms, one of which has an inviting terrazzo bathtub in its ensuite bathroom. 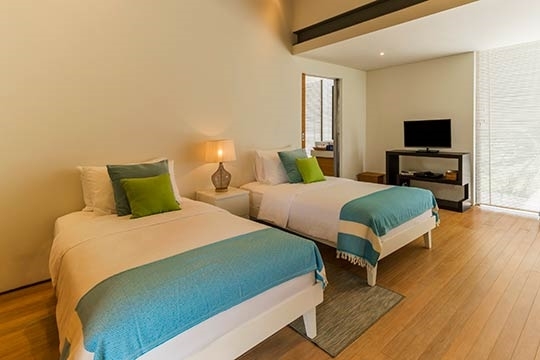 Two bedrooms with twin beds (convertible to kings) share a bright bathroom with double shower. Tucked away on the bottom floor near the entrance is a media room with a flat-screen TV and DVD player. 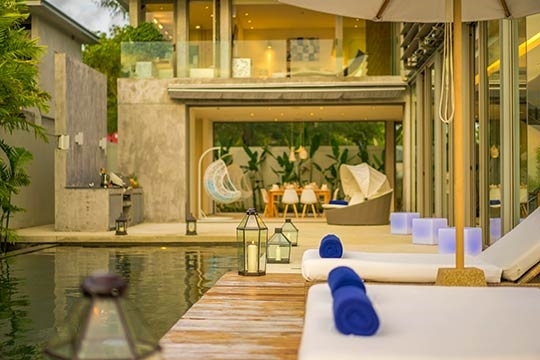 Roxo is staffed by a full-time villa manager, Thai chef and two housekeepers, complemented by the assistance of the estate villa manager and concierge service to help with the likes of transport or dining and golf reservations beyond the villa. Daily breakfast is included while other meals are easily arranged with provisions charged to guest account. 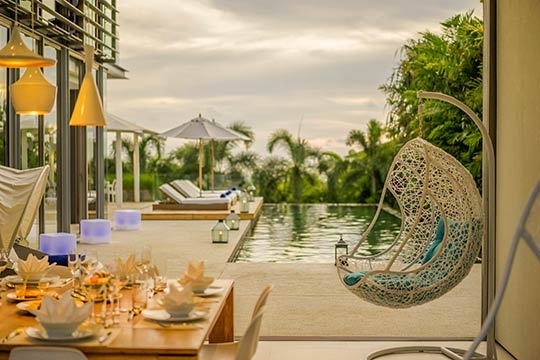 The chef specialises in Thai and seafood dishes, but is able to prepare western food and kids’ menus as needed. 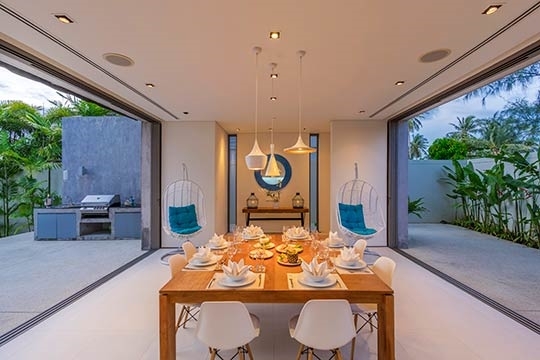 For larger groups requiring more accommodation, another four-bedroom home of similar design, Villa Aqua, is set beside Roxo, while five larger villas (six-bedroom villas Amarelo, Essenza, Cielo, Tievoli and Malee Sai) are set along the beachfront within Sava estate. 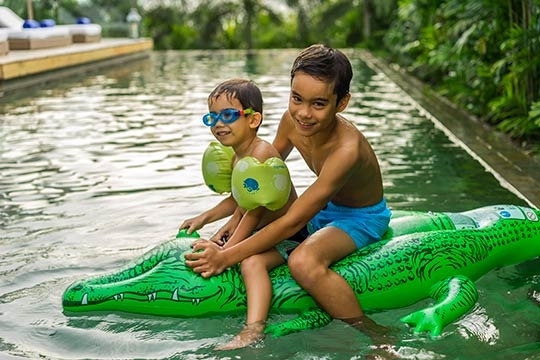 Aside from other villas, the long, wind-swept beach and a quiet, shady road, there’s little within walking distance of Villa Roxo, thus car hire’s essential for those who wish to explore the area. 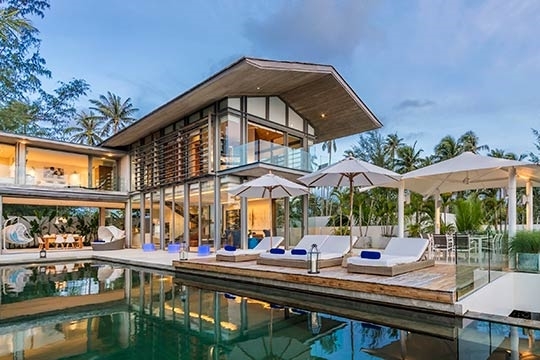 A poolside soiree is a must-do here. 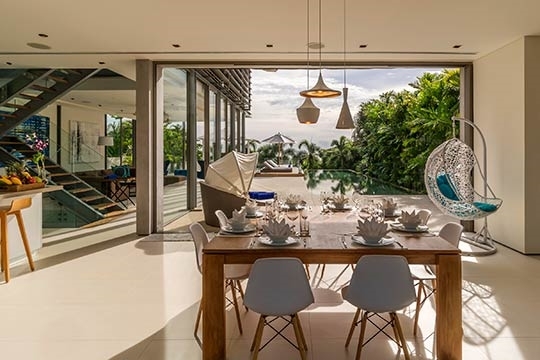 Villa Roxo’s design has a modern edge, yet its ambiance is cheerful, relaxed, and feels just right for the tropical setting. 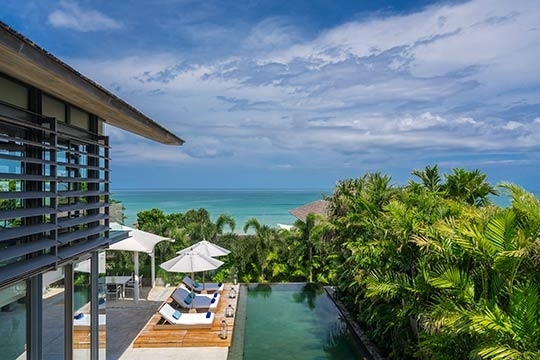 It’s easy to settle in, slide open the heavy glass doors and let the sea breezes flow as generously as the champagne you’ll crack open to celebrate arriving at one of Thailand’s most beautiful, peaceful beaches. The staff are equally as cheerful, and the maid always seemed to magically arrive just when a glass needed filling or a towel sourced. Though families are welcome, the sophisticated Sava leans more towards groups of adults – more ‘hen party’ hang-out than nest for mother hens. We didn’t party during our stay (we had work to do!) 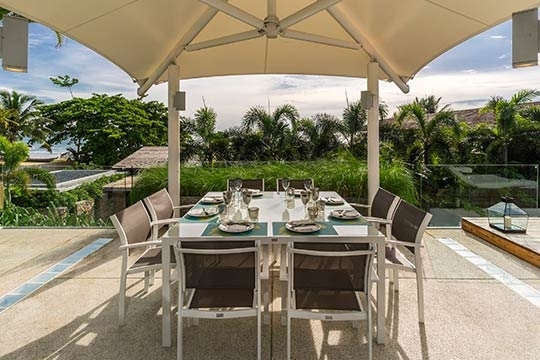 but with the chef and the divine open layout, a barbecue poolside soiree is a must-do here. 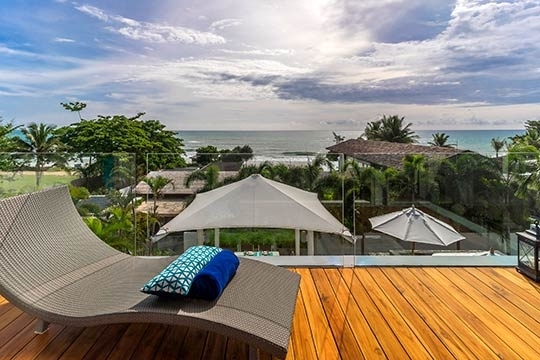 There’s very little to fault with this villa, though, if we really have to be picky, being in the second tier of the estate means it takes that extra few seconds to reach the beach, and views are partially blocked by the villas in the front row. Although there’s plenty of privacy here, and peace and quiet abound in large doses, Roxo is part of an estate so it lacks the feel of a total hideaway. While we loved the sunny days, our favourite time was the evening, just after sunset. Sipping a glass of wine while soaking our feet in the pool, gazing up at the sparkling night sky to the sound of the waves – ahh, those tranquil tropical nights are heavenly! Sea, sand and sunsets – tropical perfection! Many highlights here at Roxo: professional and friendly service, stunning location, fabulous views, vibrant design. 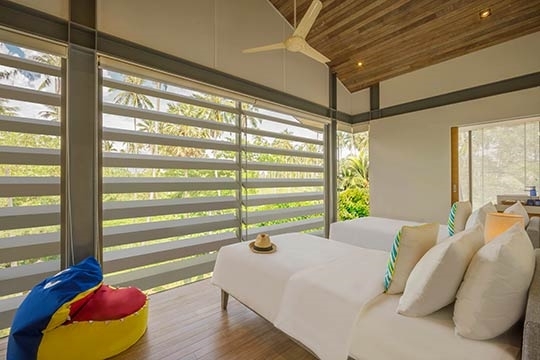 So close, yet not quite there – though the soft sands of Natai can be reached in seconds, Villa Roxo is separated from the beach by a row of villas. 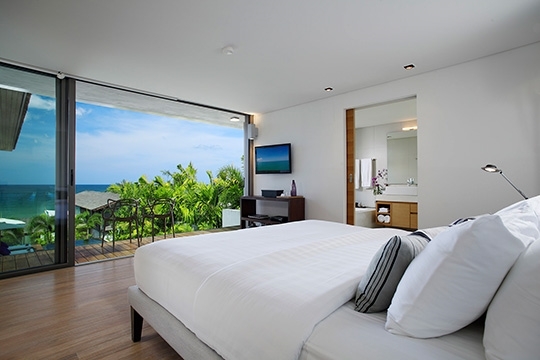 One of the twin-bedded rooms lacks a sea view, though its large windows overlook a pleasant tropical landscape. Thank you for the wonderful service. We had an amazing time at this villa. We would definitely recommended this place to our friends in Canada. We had a wonderful time here great service, delicious food and stunning view. Staff are all friendly and helpful. Thank you very much and we hope to see you guys again. 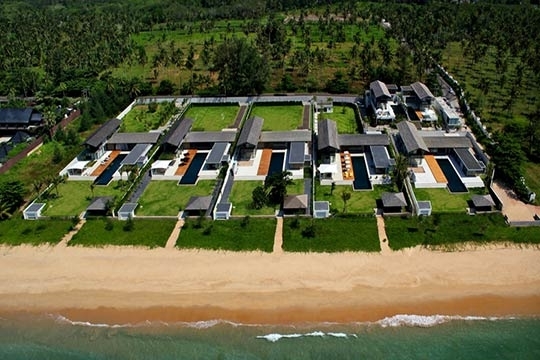 It’s getting harder to find in Thailand, but in the Natai Beach area the landscape remains rural and people lead a quiet, traditional way of life. Natai – whose soft, white, virtually deserted sands stretch for 10 kilometres along the shores of the Andaman Sea – lies in the south-west of Phang Nga province, just over the bridge from Phuket. Even at the height of the season there are just a sprinkling of people on the beach, and absolutely no commercial activity. The rickety old pier that you can see from the villa is probably 100 or more years old, once a launching point for transporting tin (the main industry in the region before tourism). You can drive for miles along the road that runs parallel to the beach, and at one point you’ll reach a public pier where, in the late afternoon, the locals come to relax while fruit and snack vendors set up their stalls. 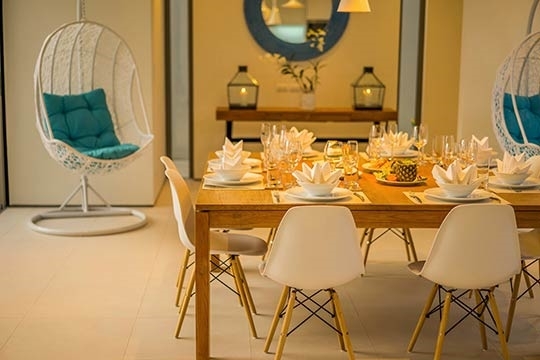 If you’re on the search for dining outside the villa, you could try the well-regarded Aleenta resort or the Iniala resort.. 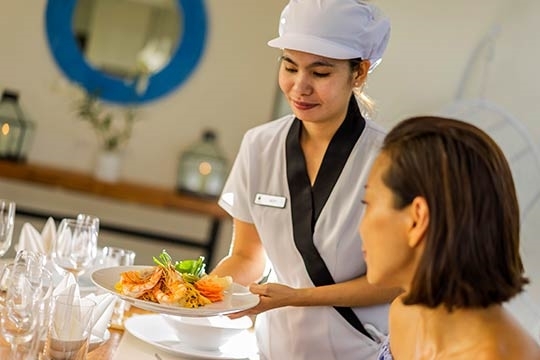 Otherwise, the villa manager can direct you to some of the excellent local seafood restaurants where you’ll get to sample some authentic Thai flavours. The nearest town is Kokkloy, about five kilometres away, where you can find basic provisions and banking services. It’s a typical Thai town, lined with shop-houses, that so far remains free of any tourist activity. 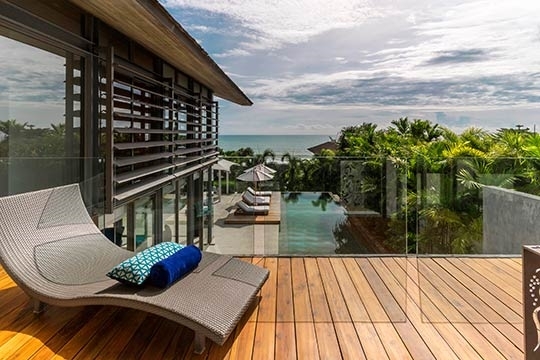 Those wishing to indulge in some golf, shopping or sightseeing can drive over the bridge to Phuket. It takes about an hour by car to reach the main resort areas and Phuket City. For diving and snorkelling, day trips to the Similan islands may be arranged, with boats launching from Khao Lak, about 45 kilometres to the north (mid-October to mid-May only). 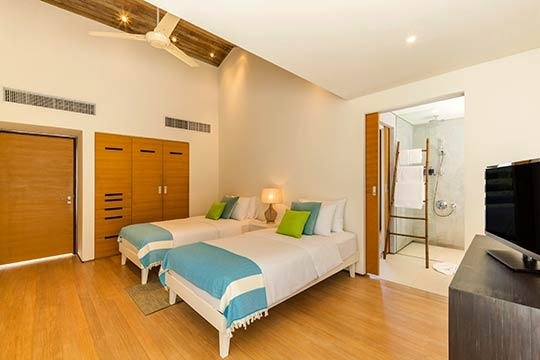 Villa Roxo is as bright and white as the sands of Natai Beach. 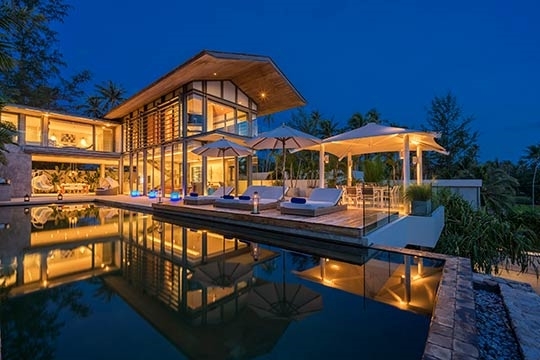 A glass house topped by a long arched roof with an underside of rustic wood, it loosely resembles an upturned traditional Thai long-tail boat. 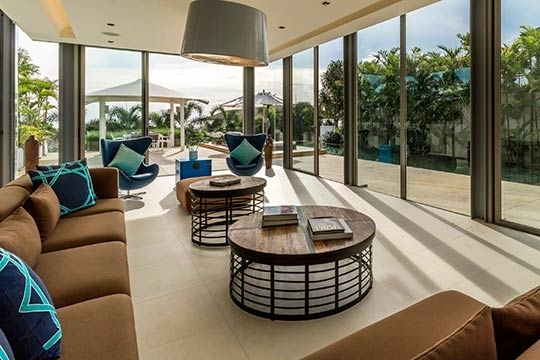 At the heart of the villa, on the main floor, is an L-shaped open-plan area, dedicated mostly to the stylish living room complete with a soft brown sofa set and large eye-catching paintings – ideal for taking it easy and enjoying the fresh sea breezes in comfort. Just behind here is the modern guest kitchen with a full range of appliances. Despite its allure, this kitchen may well remain unused, thanks to the excellent chef who prepares meals mainly in the second, more modest staff kitchen to the rear. Adjacent to the kitchen is a dining area and the living room, a cosy corner space with plush sofas. 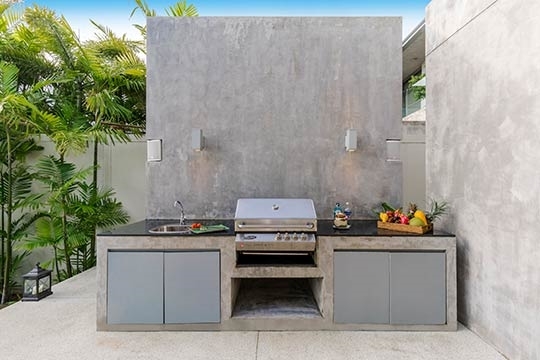 This whole area opens onto the pool terrace, which features a lounging area at one end and a barbecue-dining area under the shade of a retractable awning close to the kitchen. 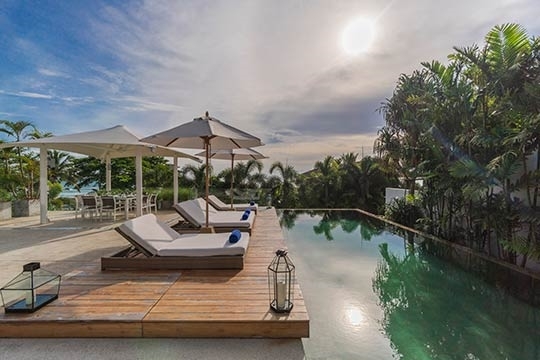 Stretching out along the length of the terrace, reaching for the sea, is the 18m saltwater infinity pool lined with sun loungers. 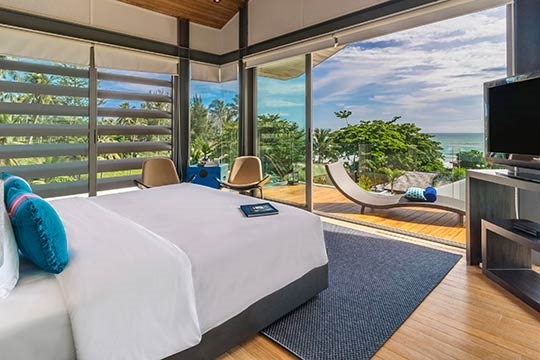 The two master bedrooms occupy the front of the top floor; the larger one fitted with a walk-though wardrobe and three floor-to-ceiling glass walls for extra-wide sea views. 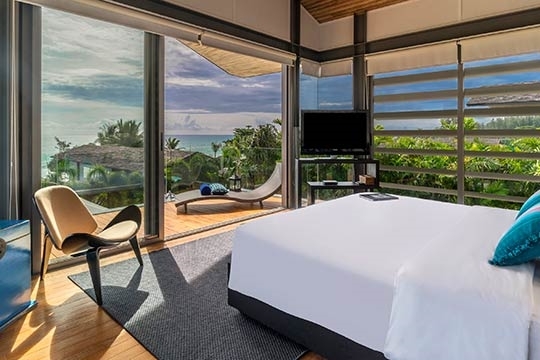 Both feature flat-screen TVs, balconies and bright ensuite bathrooms, plus spongy king-sized beds where guests will long to linger and take in the seaside panorama. 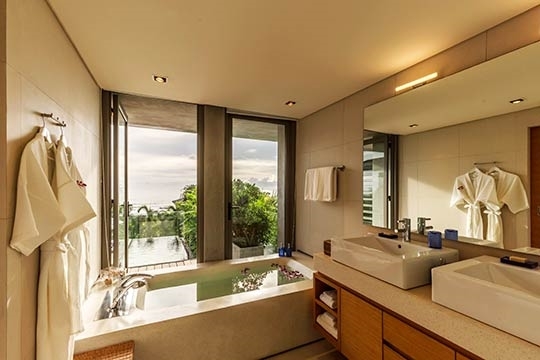 A double bathtub with sea views is set in the second master’s bathroom. 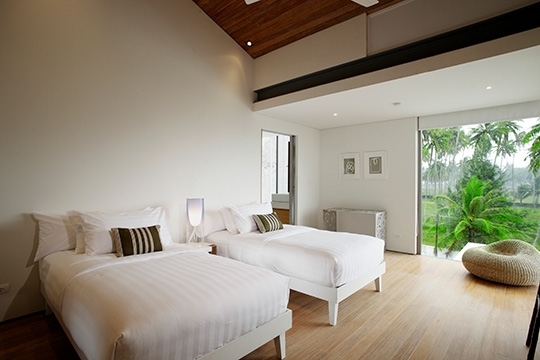 The third bedroom with twin beds and a partial sea view shares a bathroom with another twin-bedded room overlooking the garden. 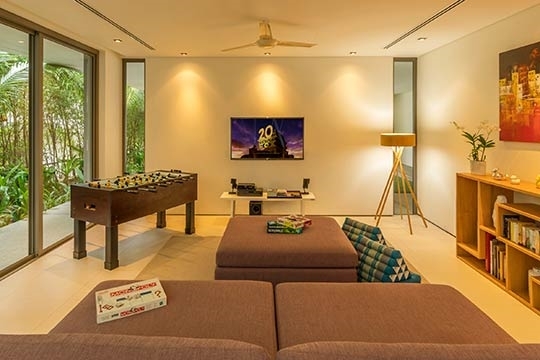 On the villa’s lower level is a media room with comfy furnishings and a big flat-screen TV with DVD player for a cool escape from the sun. 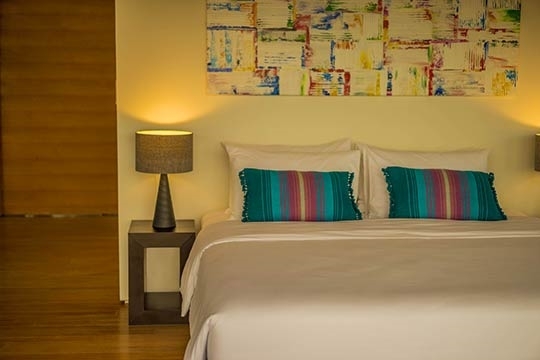 The villa’s artwork and décor is mostly in subtle earth tones, adding a relaxed and close-to-nature ambiance to the villa’s uplifting modern design. 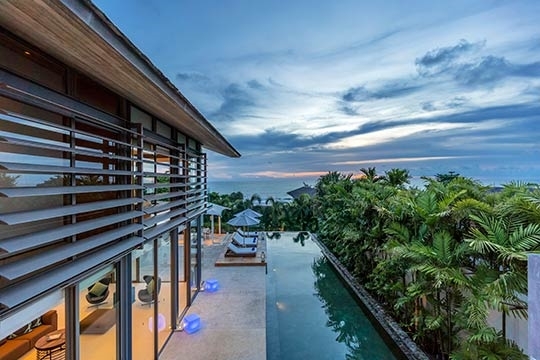 4 bedroom villa located in Natai Beach, Phuket. Ideal for Beach in ten, Body and soul, Bring the relatives, Kid friendly, Going for golf, Fair share for groups, Party pads, Sensible for seniors, Room with a view.